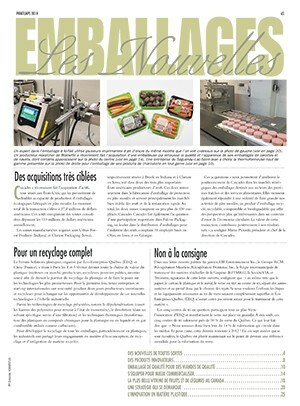 Cutline: After expanding its manufacturing base from Calgary and Vancouver into Toronto in 2016, Big Rock Brewery opted for the Kosme Barifill Rinser/Filler Bloc bottling line from Krones AG, which is a cost-effective, high-accuracy filling line designed specifically to suit the lower-throughput requirements of craft brewers looking to expand their market reach in the fast-growing segment. Much has been said in recent years about storied iconic Canadian beer brands being acquired by foreign-owned multinational brewing conglomerates—not all of it complimentary to say the least. But thanks to companies like Big Rock Brewery Inc., there seems to no shortage of a new crop of Canadian-owned brewers willing and able to keep supplying the market with genuine made-in-Canada suds to a new, more discerning generation of Canadian beer-lovers proud to support the domestic beermakers—both on patriotic principle and well-earned merit. 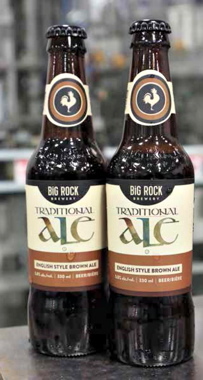 Founded in Calgary in 1985 by the late Ed McNally to create a “beer that he wanted to drink, not what would be popular,” according to the company’s website, Big Rock has gone on to become a well-recognized player on the Canadian beers scene. get-go with the launch of well-received Big Rock-branded Bitter, Porter and Traditional Ale beers that quickly resonated with the local audience—especially for the Traditional Ale recipe’s distinct toasty malt and sweet caramel and nutty flavor. A sampling of canned and bottled beer produced at the new Big Rock Brewery plant, featuring corrugated cases from Cascades, glass bottles supplied by TricorBraun, aluminum cans from Crown Holdings, and high-graphics shrink sleeves supplied by SGS Canada. Vancouver, B.C., in 2013 and, more recently, the startup of a brand new brewery in the west-end Toronto district of Etobicoke. 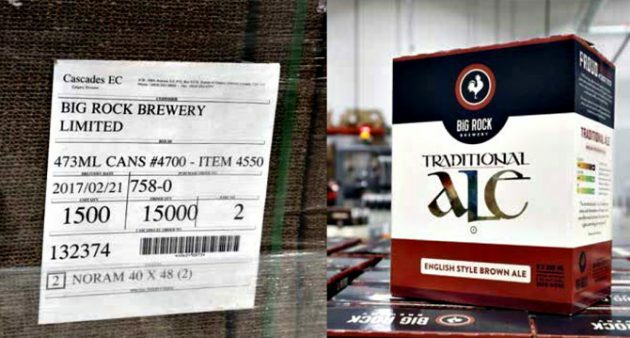 While some of Big Rock’s more popular brands have been retailed in Ontario for some time, establishing a local manufacturing presence in Canada’s biggest city is a serious statement of intent to grow its market share in eastern Canada, according to the Toronto operation’s brewmaster Connor Patrick. 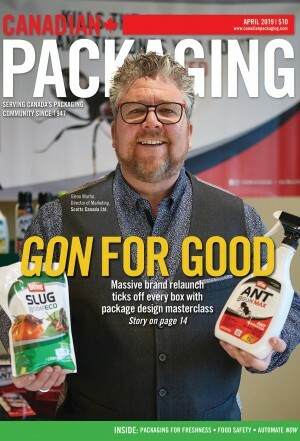 “The southern Ontario market is an extremely competitive market,” Patrick told Canadian Packaging in a recent interview, “but building our own brewery in Toronto really demonstrates our competitive streak in taking up that challenge. “We’re in it for the long haul,” says Patrick, citing the company’s expansive product portfolio bursting with traditional craftsmanship and bold flavor innovation, as demonstrated with year-round brands such as Citradelic Single Hop IPA, Grasshopper Kristallweizen, Warthog English Style Mild Ale, Honey Brown Lager, Pilsner, Rhine Stone Cowboy Kolsch Style Ale, Scottish Style Heavy Ale, Session IPA and Wunderbier, along with seasonal small-batch brews and barrel-aged favorites. 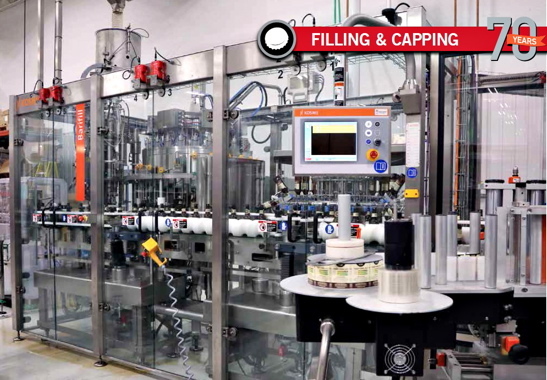 The 24-head Kosme bottle filling and capping line from Krones normally runs at the Toronto brewery at a steady pace of 90 bottles per minute, but can be amped up to 130 bottles per minute. Having joined Big Rock in Calgary about 10 years ago, Patrick immersed himself in learning all the tricks of the brewing trade under the guidance of head brewmaster Paul Gautreau, while also attending leading brewing schools to further his education in the complex, dynamic and constantly evolving industry. Obviously, running the show as brewmaster at the new Toronto facility is a proud step forward for Patrick on both professional and personal levels. Patrick relates that shortly after his once-promising hopes to play in the CFL (Canadian Football League) were dashed by an injury in his early 20s, he took an extended trip to Europe with some friends—discovering a lot of interesting Old World beers along the journey. 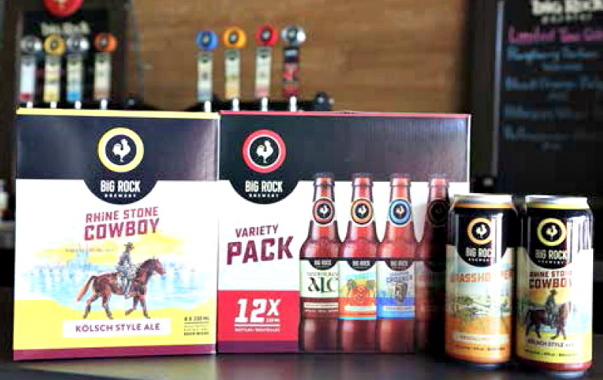 Leading Canadian paper products group Cascades Inc., manufactures and supplies the paperboard packs used by Big Rock Brewery’s Toronto brewery to pack its cases of bottled beer, as well as the trays used to pack its canned products. “It wasn’t the standard beers we had back home at the time,” he recalls. “All the European beers we tried, in particular the U.K. beers, had so much flavor and variety, and all being unique and original in some special way or nuance. “When it comes to beer, not every patch of taste-buds are created equal,” Patrick proclaims, citing Big Rock’s expansive portfolio of signature beers, seasonal brews, and even one-off beers designed by the local brewmasters for special events and occasions. Bottles of beer positioned for filling on the Kosme Barifill bottling line at the Toronto brewery. Commencing full commercial production this past January, the new plant is currently on track to produce about 7,000 hectoliters of beer this year, according to Patrick, with capacity to add another 21,000 hectoliters in the future as market demand grows. To hit the ground running in the highly competitive and crowded Ontario beer markets, Big Rock Brewery decided to outfit its new Toronto brewery with a state-of-the-art, custom-designed brewhouse manufactured by the British Columbia-based brewing equipment specialists Newlands Systems Inc.
To get the Toronto operation set up, Big Rock first contacted Newlands Systems, Inc. to custom-build a brand new brewhouse for the brewery—including all the required tanks, vessels, mixers fermenters and other essential pieces of equipment. “We opted for a 30-barrel system,” says Patrick, citing Newlands’ vast brewhouse experience and an extensive installation base at more than 500 brewing plants worldwide. 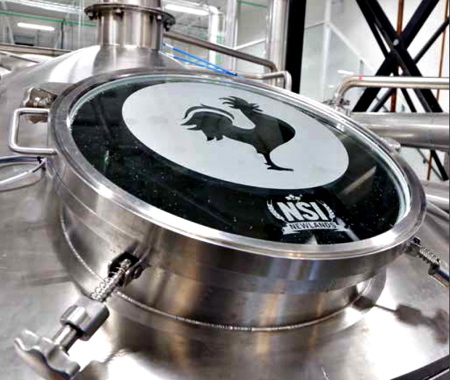 “What’s interesting about Newlands’ brewhouses is that you don’t call them up and ask them to deliver a new brewhouse: they work with you to build a customer-specific brewhouse,” he says. “And while you have to wait a little longer to have it built and installed to perfectly fit your specific needs,” he allows, “the results are worth it. 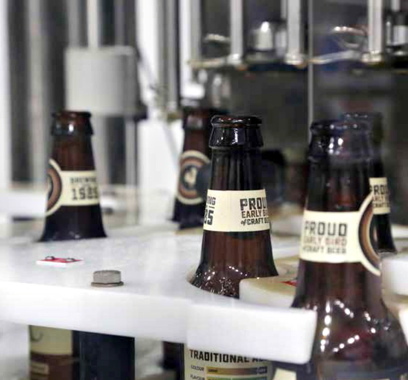 Supplied by Tricor Braun, the glass bottles used by Big Rock’s Toronto brewery have labels placed on it front, back and neck via a Krones Kosme Flexa Sensicol pressure-sensitive label applicator. 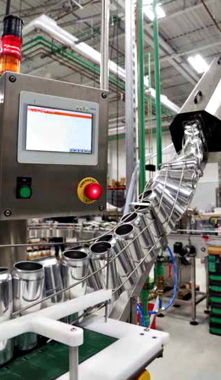 After the beer is ready for packaging, its is piped to the plant’s canning line, supplied by the Boulder, Co.-based Wild Goose Canning Systems, or the newly-installed, state-of-the-art Kosme Barifill Rinser/Filler Bloc bottling line manufactured by leading German-based beverage production equipment manufacturer Krones AG. “We already have Krones equipment installed in Calgary, which has performed extremely well and are very easy to use,” says Patrick. “So it was the case of, Why mess with success? That said, choosing the Kosme brand filling equipment—manufactured in Italy by Krones’ recently acquired Kosme business—was a first for Big Rock, Patrick notes. Used by the Toronto brewery to fill and cap the industry standard 330-ml glass bottles manufactured by Tricor Braun, with capabilities to bottle 650-ml seasonal and special-occasion beer products—the Kosme 24-head rinser and filler combination currently runs at a comfortable rate of 90 bottles per minute, with plenty of built-in capacity to speed up the throughput up to 130 bottles per minute, according to Krones. 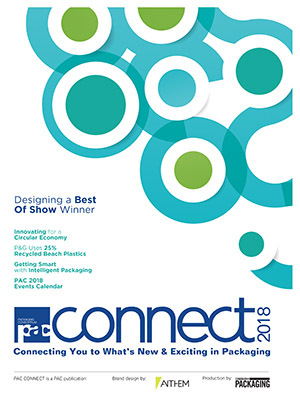 The bottles begin their packaging line journey by being unloaded from an automatic depallteizer manufactured in-house—but do also utilize a depalletizer from Ska Fabricating for its canning line—and conveyed in single file onto the Kosme Flexa Sensicol pressure sensitive-labeler, which swiftly applies three pressure-sensitive labels to the front, back and neck of the bottle. After the labels are applied, a Hitachi inkjet small-character printer, supplied by the Edmonton, Ont.-based Harlund Industries, Ltd., applies the lot code and best-before data onto the rear label. After the aluminum cans are rinsed and dried, they are turned rightside up on the inverted conveyor line heading towards the Wild Goose Canning line. The bottles are moved further downstream, where they are flipped upside down on the conveyor to receive a quick water rinse, followed by a quick purge with a blast of carbon dioxide, making sure they are totally dry upon entering the 16-valve Kosme Barifill Rinser/Filler Bloc unit. The Kosme Barifill utilizes robust, pneumatically-actuated Krones filling valves providing Big Rock with quick, non-foam fills to ensure superior beer integrity. The actual fill process consists of a tube bottom filling the beer, with a probe attached at the top to monitor the fill. As the bottle reaches the pre-set fill level and the liquid comes in contact with the probe, an electrical discharge is communicated to the filling system that the bottle is at the optimum fill height. a highly hygienic design with no sharp corners that could allow dirt to accumulate. Once filled, the bottles are quickly crowned with a securely placed cap before exiting the Kosme Barifill unit. The bottles are rinsed again and then moved through a warming tunnel, designed to physically raise the temperature to prevent condensation forming on the bottle and label. “Along with it preserving the integrity of the label, by stopping the bottle sweat, we also prevent it from damaging the shelf packs,” says Patrick. Retailed in Ontario at LCBO (Liquor Control Board of Ontario) and The Beer Store outlets in six- and 12-pack cases, the bottles are manually packed into paperboard packs, supplied and made by Cascades, and sealed on a semi-automatic casesealer with hot-melt adhesive supplied by Technical Adhesives Limited of Mississauga, Ont. For their part, the 355-ml and 473-ml blank cans manufactured by Crown Holdings coming off the canning line already outnumber the bottled product, according to Patrick, although the number can fluctuate throughout the year depending on seasonality and market trends. 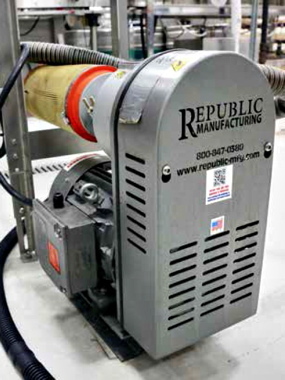 A Republic air knife blower supplied by R.E. Morrison dries all excess moisture off the beer cans immediately after filling. After being filled and crowned with a crimped cap at rates of 32 cans per minute, “The cans then pass through a warmer to stop condensation from forming on the package surface,” Patrick explains. “By ensuring there is no condensation forming in the can, it helps our shrinksleeving equipment to apply a snug plastic film sleeve over the container,” says Patrick. 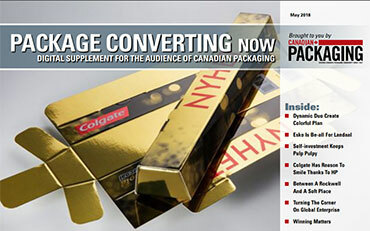 After the film sleeves produced by SGS Canada are properly affixed by the shrinksleeve labeler manufactured by Pack Leader Machinery Inc., the cans pass through a heat tunnel to produce a tight seal around the container with the brand’s graphics. 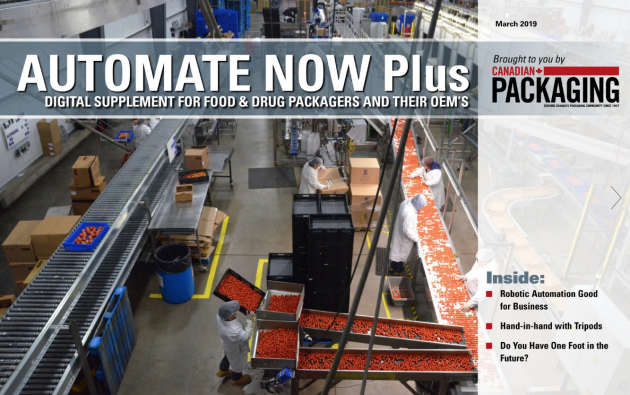 The cans are then hand-placed onto 24-unit corrugated trays, also produced by Cascades, covered with a clear plastic film sheet, and moved through heat sealer to secure them in place. All in all, Patrick says he’s very encouraged by how well the Toronto brewery’s startup and early production have gone so far, singling the new Krones Kosme filler for special high praise. “The relationship between Big Rock and Krones has been very good for a number of years,” he notes, “and it was no surprise that the Calgary headquarters reached out to Krones again after deciding to expand into the Ontario market. “I’m certain that Krones people will fully agree that our partnership has worked out very well for both companies so far,” he adds, “and will continue to grow in coming years,” he concludes. “As Big Rock continues to grow, our relationship with Krones will continue to be an important asset in making this new brewery a highly successful operation.